A semi-annual report has been completed for the pretreatment program. 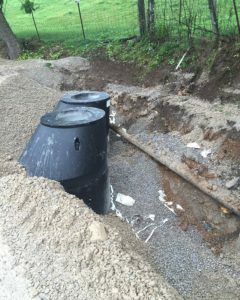 A 2016 Community Development Block Grant Sewer Rehabilitation project was funded by ECD to aid in the $1.15M Sewer Project. The survey is complete and design is underway. Design is 90% complete for improvements to the Peak Wastewater Diversion Pumping Station. The Capacity Assessment Plan, Sewer System Evaluation Survey Work Plan, Fats, Oils and Grease Control Program, Sanitary Sewer Overflow Response Plan, Pump Station Operation and Preventive Maintenance Program, Continuing Sewer System Assessment Program, Infrastructure Rehabilitation Program, and Information Management Systems and Capacity Assessment Report are complete and approved by EPA as part of the Administrative Order of Consent. Cleary Construction was the low bidder on the Carters Creek Pumping Station Renovation project in the amount of $651,000. Contractor plans to begin work late November and has an expected completion date of March 16, 2017. Bids for the SSES work were opened September 29 with the low bidder being First Response Environmental Group of Goodlettsville, Tennessee, with a low bid of $336,980. An alternative additive was included in the amount of $35,000. Construction for the Holiday Drive and Lantana Estates Water Line Replacement Project, which consists of the replacement of 19,000 L.F. of 6-inch asbestos cement water line, is underway with a revised completion date of December 30, 2016. At this time, approximately 15,500 L.F. of 18,215 L.F. of 6-inch pipe has been installed. Preliminary work has begun for the Meadowpark and Holiday WTP Improvements project which includes replacing the 800 KW gensets, constructing a new chemical building, as well as sandblasting and painting the pipe gallery, and replacing the existing Trac Vac system. A pre-construction conference was held July 13 for the Sewer System Rehabilitation project, in the Kayser Roth area, in the amount of $449,596, and has a completion date of April 2017. Dynamic Construction will be the Contractor on the job. The engineering report for improvements to the WWTP is complete and has been presented to Dayton. 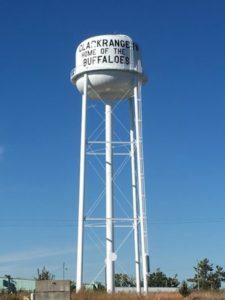 The new 200,000 gallon Clarkrange Elevated Water Storage Tank project, with the low bidder Phoenix Fabricators and Erectors at $610,717, has been constructed with contractor working on site piping and grading. The Highway 127/62 utility relocation project through TDOT has a letting date of June 2018. The draft NPDES Permit was issued by TDEC and a response has been submitted. The dormant pre-treatment program has been approved by TDEC. Annual reporting is required. The $10.5 million North Wastewater Treatment Plant expansion is nearing completion with all new unit processes in operation. Only punch list items remain. Design of the South Water Treatment Plant Renovation is complete and plans and specifications have been submitted to KDOW. This project includes a new 4.0 MGD GE Water and Process Technologies Membrane Filtration System, Flash Mix Structure, Solids Contact Clarifier, and GAC Contactors. 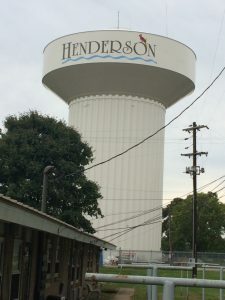 Construction of the 1.0 MG Vine Street Water Storage Tank Renovation was awarded to Preferred Sandblasting of Shelbyville, Tennessee at a total contract amount of $845,700. Renovation of the Water Storage Tank is complete and only punch list items remain. Design of the North Wastewater Treatment Plant Final Clarifiers No. 1 & No. 2 Rehabilitation project is complete and construction is underway. A pressure study for the Graham Hill Tank Area Distribution System Improvements project is underway. 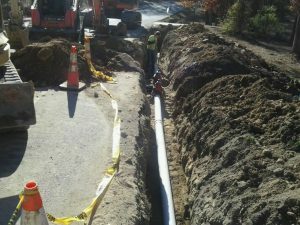 The ARC/SRF project for Lewis County and Hohenwald that extends a 6-inch water line approximately 28,000 L.F. along Summertown Hwy. is complete with only punch list items remaining. This $557,194.47 project has a completion date of December 8, 2016. A semi-annual report in reference to the pretreatment program has been submitted to TDEC. The Appalachian Regional Commission recently announced award for the Water System Rehabilitation project in the amount of $500,000. Design will begin in 2017. Specifications for a 2016 Community Development Block Grant focusing on Water Rehabilitation are being prepared. Construction on Phase 7 Priority No. 2 Sewer Rehabilitation Project is complete. Plans and specifications for Phase 7 Priority No. 3 are complete and have been submitted to the Owner. Design is 90% complete for sewer extension to Farm Credit Services which will accommodate future growth. Survey is underway for the Hammond Wood WWTP Expansion. An evaluation of the Wastewater Treatment Plant and Rate Study have been submitted and are under review by Humboldt Utilities and TDEC. The 2015 CDBG Project for the Lagoon Aeration System and Sewer Rehabilitation project is complete and closed out. This project cost was $503,724.50. Humboldt Utilities was awarded a Site Development Grant for a waterline to the Industrial Park. The survey is complete and the design is underway for this project. Bids were opened for SRF funded improvements at the Miller Avenue Wastewater Treatment Plant on July 25 with Garney Construction being the low bidder in the amount of $2,999,257.48. Commence work date is November 2016 with an expected completion date of August 11, 2017. A $13.3M Disaster Community Development Block Grant was awarded for five separate projects including Miller Avenue WWTP work, sewer line replacement and rehabilitation, sewage pumping station renovation, and dual South Fork Forked Deer River utility crossings. Preliminary work is underway. Plans and specifications for the State Route 50/431 Utility Relocation have been submitted to TDOT. The project is scheduled to bid December 2016. Design of methanol and coagulant feed and storage facilities to enhance nutrient removal is complete and has been submitted to TDEC SRF. Modifications to the Facility Plan are underway. Plans and specifications for the Snell Branch Sewage Pumping Station are complete and have been submitted to TDEC SRF. Bids for the WTP Backwash/Water Supply Modifications were opened Thursday, November 3 with the low bidder being Contracting Services, Inc. of Culleoka, Tennessee at $179,560. A WWTP Nutrient Optimization Plan was submitted to TDEC, late summer 2015, which resulted in a revised NPDES Permit. Further monitoring has been performed to confirm optimized plant operation. The TTU Water Center for the instream monitoring program and Pennington and Associates for the bio assessment program have become involved. The bio assessment program was completed in September 2016 and reports from Pennington and Associates are underway. The instream monitoring program is underway and will be completed August 2017. J&M Grading Division, LLC was the low bidder for the TDOT SR 52 Utility Relocation project. The Contractor is nearing completion. Design of the Monroe Water System Improvements is underway which consists of 33,000 L.F. of 6 and 8-inch water line and a booster station renovation. Design of the renovations of six sewage pumping stations is also underway. A Drought Management Plan has been completed and approved by the State. Bids were opened Tuesday, August 30, for a project providing for the clean out of Polishing Pond No. 2 at the Wastewater Treatment Plant. Low bidder was W&O Construction with a bid of $150,268. Design is complete for approximately 3,500 L.F. of sanitary sewer line replacement in the Madison Square area and has been submitted to the Owner for submission to KDOW. We have submitted a water model to assist Madisonville in determining the efficacy of proposed system improvements to the north high pressure zone. Water Quality Modeling work is underway to determine the impacts of a reconfigured effluent discharge concept. The intensive field sampling is complete and calibrated model was accepted by TDEC. Currently, scenarios are being prepared for permitting negotiations. Design of a new Sludge Thickener and two new belt presses is underway. Horsley Construction was the low bidder for Phase I Water Improvements, which include 15,876 L.F. of 16-inch North Transmission Line, in the amount of $965,089. Construction is underway with approximately 14,000 L.F. being installed. An expected completion date is May 2017 but project will be finished early, pending weather. Bids were opened November 15 for 21,000 L.F. of 3-inch and 4-inch water line on Baizetown and Cave Ridge Roads with the low bidder being Horsley Construction at $328,711.80. H&A Resource Management was the low bidder for the WTP Lagoon Sludge Removal Project at a cost of $121,875. A study of the current anaerobic digestion process at the WWTP is complete and submitted to the Owner. Construction on the Johnson Controls Pumping Station and Sludge Pump Replacement project is complete with a total cost of $233,000. The semi-annual report was completed. The final adoption process for the Local Limits has been initiated. Phase I of the TDOT State Route 128 road widening is nearing completion. This project includes relocation of water, sewer, and natural gas utilities. Barsto Construction is the Contractor and the scheduled completion date is November 2016. Phase II of the TDOT State Route 128 road widening utility relocation plans have been submitted to TDOT for a scheduled letting of December 2016. A semi-annual report was completed for the pretreatment program. Survey work for the Harbert Drive Sewer Rehabilitation project is complete. A Community Development Block Grant for water plant improvements was awarded to Quinn Construction in the amount of $271,740. New media has been installed and both filters are in operation. The project has a completion date of November 2016. W&O Construction was the low bidder for the renovation of the 2.16 MGD SBR Wastewater Treatment Plant, in the amount of $2,807,600. Construction has begun and a 365 day construction timeline is expected. The $227,116 Main Street Gravity Sewer Replacement Project is complete and closed out. The Drought Management Plan was approved by the State. The Capacity Assessment Plan and Engineering Report for the WWTP have been completed and submitted to TDEC. The 2015 Community Development Block Grant project that will include a new influent pumping station at the WWTP, was awarded to Quinn Construction with a low bid of $499,000. Work is scheduled to begin this month and be completed by the end of the year. The design of a new 1.6 MGD Sequencing Batch Reactor Wastewater Treatment Plant is complete and being submitted to TDEC. NPDES Permit Renewal Application is complete and has been submitted to TDEC. The 8-inch waterline on Martin Luther King Drive in the amount of $61,689 is complete and closed out. Local Limits have been approved by TDEC and adopted by the City. Construction of I-69 Phase III is continuing and utility work is anticipated to be complete by the end of the year. Bids were received for the 2016 Utility Rehabilitation project on September 29 with the low bidder being John T. Hall at $1,579,347.